Brenda Howell began her love affair with the Grand Canyon on Thanksgiving Day in 1970 when she and her sister first hiked five miles down the Bright Angel Trail to Indian Gardens. It was a life-changing experience on many levels. Years later, while working as a graphic artist and geological illustrator, she began painting again. There was no question about the subject. 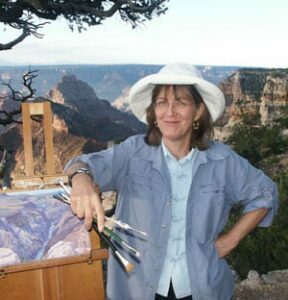 She made her first painting of the Canyon and it has been a dominant theme of her art throughout her painting life. Art was a very important part of her early years. Her mother, while teaching private art classes, encouraged Brenda to paint her first oil painting at age five. This early introduction to the process of sketching and outdoor painting was instrumental to her interest in and love of landscape. One of her fondest childhood memories is of a trip to Rocky Mountain National Park where her mother painted outdoors at Bear Lake. Her mother also taught her to draw her own paper dolls and paper doll clothes, complete with tabs. She graduated with a B.A. from California State University at Fullerton, and studied art at Orange Coast College, Fullerton College, Tulsa Community College, Philbrook Art Museum School and Scottsdale Artists’ School. She has always studied the art of master painters in art museums, being particularly inspired by Thomas Moran, Gunnar Widforss, Carl Oscar Borg, Georgia O’Keeffe, Edgar Payne, Birger Sandzen and Maynard Dixon. Howell worked more than twenty years as a Graphic Designer and Technical/ Geological Illustrator, which led to a successful freelance business. But fine art kept calling her. After spending a year in India and traveling in Europe and Australia, she decided to immerse herself in her favorite place to paint, the Grand Canyon. She came to live at the South Rim of Grand Canyon National Park in 1999 and stayed for four years. In the tradition of Gunnar Widforss and other artists that made Grand Canyon home, this experience transformed her work and her life. Howell was honored to be given a solo show at Pearce Western Art Museum in Texas in 2010. She was also chosen by the National Park Service as Artist-in-Residence at Badlands National Park in the Fall of 2010. Her work resides in the permanent collections of both institutions and is in private collections throughout the U.S. and abroad. Her work has won many awards in such shows as Oil Painters of America Annual Exhibition, American Women Artists Annual Exhibition, Salon International, and Art Renewal Center. She has shown in both annual and regional shows such as Oil Painters of America and Arts for the Parks, among others. Painting full time since 2003, Howell paints primarily in oil, both in the studio and outdoors.